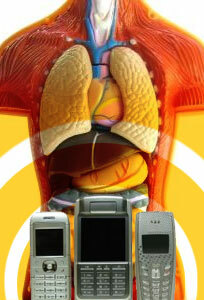 Could cell phone harm other vital organs in your body? There are issues which are constantly the matter of public debates and those related to health are the most controversial ones. Cell phone is one of the most praised and yet most disputed inventions of the twentieth century. Hardly anyone can imagine their life without this useful gadget nowadays but on the other hand its possible dangerous effects on human brain are constantly under the scope. The first problem that has to be dealt with when we are talking about cell phones is that of the radiation. The radiation which cell phones emit is electromagnetic radiation. Let’s boil this down to very simple language. Namely, every cell phone has a transmitter whose role is to encode the sound of voice into so-called continuous sine wave, which has the ability to travel through the space eventually reaching a receiver situated in the cell-phone tower. Those sine waves are sent to the receiver via antenna, in the form of radio waves. And now we have come to the point of our interest. Those radio waves used for sending the signal are composed of electromagnetic radiation and if we take into consideration the idea the proximity of the antenna to the head and brain, it is only logical to suspect that this whole apparatus is not so harmless. Do Cell Phones Really Increase Brain Cancer Risk? Since there is no doubt that cell phones emit electromagnetic radiation, people can’t help but worry about whether the use of cell phones actually increase brain cancer risk. On one side of the coin we have large cell phone manufacturers and telecommunication companies and they all claim that this whole thing is just exaggeration and that there is no reason to panic over something like that. Of course, we shouldn’t jump to any conclusion and claim that cell phones are dangerous, but we should also remember that those companies have a large profit which they want to protect. But the other side of the coin we have numerous researches which are carried out in order to see if there is some kind of connection with electromagnetic radiation of the cell phones and brain cancer. According to an editorial by Lake Forest Hospital neurosurgeon, Dr Pawl, some of the recent studies of the long term effects of electromagnetic field (ELF) have suggested that there is a link between ELF exposure and brain cancer. But still, the researchers cannot provide us with the exact evidence of the case in which ELF has lead directly to brain cancer. A recent research carried out by a team of Swedish researchers has come to the result that there is an increased risk of brain cancer in cases when people use cell phones more than ten years. Moreover, they have come to the conclusion that there is also a high risk of acoustic nerve tumors in the same case. What is more striking is the fact that those tumors usually tend to appear on the side of the head where cell phone was frequently used. All those information, no matter how imprecise they are, should be enough for a moderate level of concern each time when we want to have a long conversation on the cell phone.